In the week that former WPP chief Sir Martin Sorrell faced claims of bullying behaviour and paying for a prostitute, the ad group will be breathing a sigh of relief after an AGM that avoided a showdown. Roberto Quarta, the executive chairman, gave nothing away about the Sorrell personal misconduct saga but his confident body language and beaming smile spoke volumes. He unveiled the preliminary results of the votes at the start of the meeting, which showed he had easily been re-elected and the remuneration report had passed. Shareholders – many of them elderly small investors – still asked plenty of pointed questions about Sorrell and how he is set to collect £20m worth of shares as part of his long-term incentive plan (LTIP) despite his abrupt exit. One investor, Phil Clark, congratulated Quarta for addressing the "elephant in the room" at the start when the chairman had noted Sorrell’s absence but insisted the WPP board couldn’t say anything about the circumstances of the chief executive’s departure because of strict "legal advice". However, Clark pointed out that Sorrell, who had no non-compete clause in his WPP contract, has already set up his own company, S4 Capital, and asked: "Surely that must constitute gross misconduct, if he’s competing with the company, and at that point, should we not pull the plug on the LTIP?" Quarta countered by quoting Sorrell, who has apparently said S4 Capital will only be a "peanut" compared to WPP. 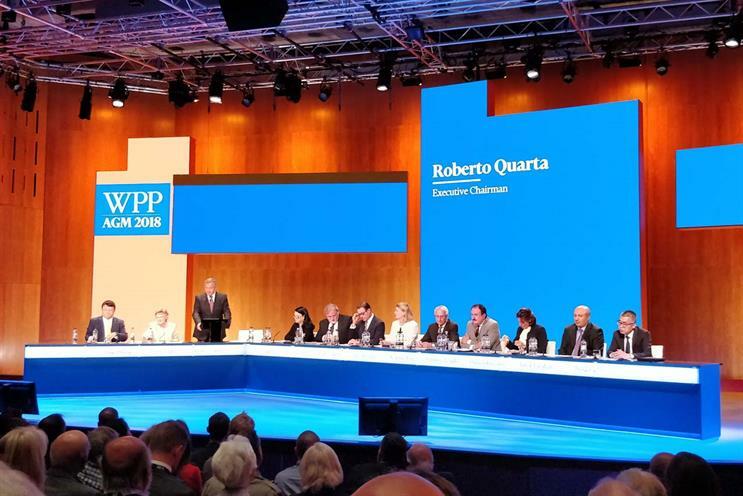 Another investor, John Marshall, was not satisfied, asking if Quarta now accepted that succession planning at WPP had been "inadequate", and asking for an assurance that when a new CEO was appointed, he or she would not get "the sort of obscene remuneration that this company has given in the past". The chairman responded that he had already curbed the CEO’s remuneration package when Sorrell was still in charge. Even so, Quarta admitted the new CEO could earn bonuses worth as much as eight times salary. "Too high," a small investor muttered loudly from the floor. While the anger about the money going to Sorrell was palpable, there was plenty of affection for the man who built the company from scratch. Shareholder Paul Walker criticised Quarta for not opening proceedings by paying tribute to Sorrell "for the work he has done for this company over many decades". Walker said: "It was time that Sir Martin stepped down, but I think it’s disappointing it was done on the basis of what I consider to be highly immaterial issues." He picked up on the "peanut" reference and said: "I hope he doesn’t build his company into too great a peanut with which to fire at the rump of this WPP elephant." After the meeting, shareholders offered mixed views about Sorrell, who has "strenuously" denied paying a prostitute and has "unreservedly" rejected allegations of personal misconduct. One shareholder told Campaign he had voted against the remuneration report and against the re-election of the entire board because they were "collectively responsible for the decision to dismiss [Sorrell] in a humiliating way". He went on: "Whatever you think about the allegations being made, he built this business up from scratch. These people wouldn’t have their jobs without him." The shareholder added that Quarta’s comments on Sorrell not directly competing with WPP were "astonishing" given that "the industry now favours the Davids over the Goliaths and if he [Sorrell] recruits the right people, he can very quickly pick up the clients." Another investor criticised the board for not disclosing more information about Sorrell’s exit. "Typical English ‘hide behind the law’," the shareholder said after listening to Quarta. "They [the board] got off lightly." Lynne Cox, a small investor, said she abstained in the vote on the remuneration report but felt it had probably been time for Sorrell to leave. The idea of paying tribute to him at the start of the AGM was "ridiculous", she said. Another, Premji Patel, summed up the mixed feelings many shareholders are likely to have had about Sorrell. Patel said he voted against the remuneration report, but had not been happy to see Sorrell leave because of his contribution to WPP. "The company was his baby, but he was taking so much money," Patel said. What WPP looks like without Sorrell remains to be seen. Mark Read, the joint chief operating officer, who is in temporary charge and a candidate to be chief executive, laid out five key aims to get WPP growing again in a brief address: Be more client-centric, put creativity at the heart of the group, focus more on data and technology, simplify the structure and ensure there is an "inclusive culture". That final point looked like a nod to recent media reports about Sorrell’s behaviour, although Read said afterwards he "did not recognise" the stories about bullying from his own experience. "We start the future with tremendous strengths," Read told shareholders. And, he could have added, an elephant-sized hole at the top of the company. WPP’s top brass looked relieved that the meeting had passed virtually without incident after the bruising drama of recent days and weeks. Life without Sorrell at WPP will take getting used to. "It hasn’t got his sparkle," one small shareholder said wistfully as she left the room.